In a context where debates in Europe are focusing on budgets and on the reduction of spending in the public sector, fighting wasteful corruption in the defence sector appears to be a logical measure. It was thus a timely workshop that the Global Governance Institute, the Institute for European Studies and Transparency International’s programme on Security and Defence, organised on 18 September to introduce the new TI Global Index Report. The secrecy and confidentiality that surround most of defence and security activities increase Ministries’ and Armed Forces’ vulnerability to corruption risks. 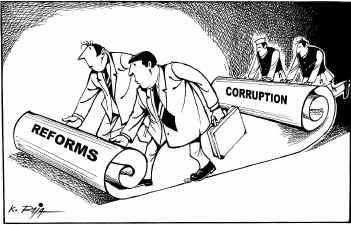 If we understand corruption in its broader definition as entailing political, financial, personnel, operations and procurement dimensions, the risks are manifold. Based on the study of 82 countries, the Government Defence Anti-Corruption Index measures levels of integrity in government defence and security establishments across the world. It offers knowledge, understanding and recommendations to governments, armed forces, civil society organisations and citizens on preventing corruption risks in defence and security. Vulnerability of the defence sector to corruption is at the same time dangerous, as it undermined operational effectiveness and can hinder the safety of troops and citizens, divisive, given that it negatively affects trust in government and armed forces, and finally, wasteful for the reason that it diverts money from other sectors in need. Although the report reveals that most governments under review do little to prevent corruption in their defence establishments, it appeared that, frequently, senior officials and officers are deeply aware of the risks that their sector faces. But more importantly, they also seem concerned about the fact that corruption scandals hinder government and citizens’ trust in their establishment. Andrew Feinstein, Former Member of the South African Congress and author of “The Shadow World: Inside the Global Arms Trade, spoke about the challenges encountered by Parliamentarians in fighting corruption in defence, drawing from his own experience at the times of the major deal between South Africa and Sweden for the procurement of fighter aircrafts in 1998-1999. Although the South African Congress was institutionally constructed in a way that public accounts were closely monitored by a non-partisan independent committee, the corruption surrounding the Strategic Defence Acquisition destroyed the role of that committee and the legislative oversight in place, and has significantly affected politics in the country ever since. When asked what strategy was best suited to tackle the problem of corruption, Andrew Feinstein argues that there is a need to carefully combine a technical approach with a political one. However, nothing can be done without overwhelming public support; technical arrangements are a necessary precondition, but they need to be fully supplemented by political measures and wider public support. The December Council and the recent Commission communication on defence place developing military capabilities and supporting European defence industries at the heart of defence questions. However, the upcoming Council will not include any discussion on the issue of corruption in the sector. Let’s make it clear; this is not because EU Member States are exempted of it. As presented in the GI index, most of EU countries rank in the third band (out of six), which contains states with a moderate level of corruption risk, mainly due to inadequate controls with regard to asset disposals, spending on secret items and legislative scrutiny and audit. Mark Pyman also noted that, if many European states “tick the boxes” in the survey questionnaire in institutional arrangements, exceptions are frequently made. Nonetheless, as “Pooling & Sharing”, “coordinating defence spending” and “acquiring commonly-owned assets” have lately become the economically-driven buzzwords of discussions and considerations on European defence, raising the issue of defence oversight may tip in and gain public support. Maybe something to be considered before December 2013? This entry was posted on 20/09/2013 by ISIS Europe in Conferences, Myrto Hatzigeorgopoulos and tagged corruption, Defence, EDA, EU Institutional Reform & Oversight, EU Mutual Defence.